“Where are you?” is one of the most commonly texted questions in the world. We have all been there waiting for a tardy friend or colleague at a restaurant or coffee shop and texting that question. We all know that it is an awkward experience to be the one sitting all alone at a table set for four while waiting and waiting. Alas, a mobile app has come to the rescue! 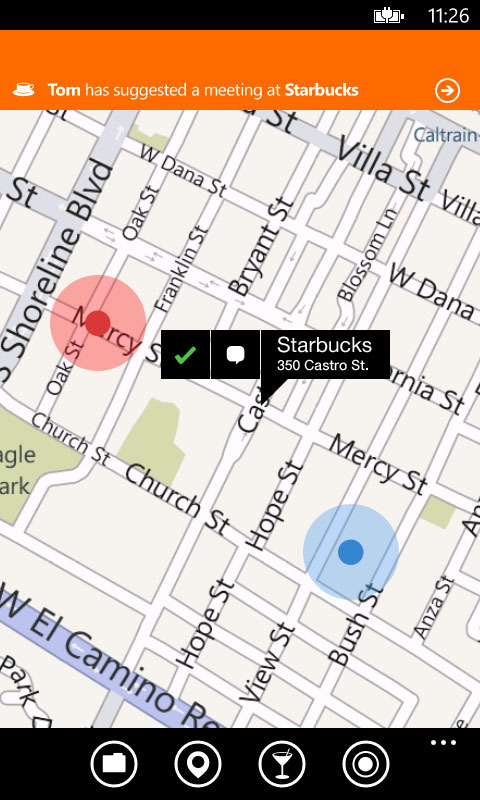 Echoecho is a simple location-based mobile application for finding friends in the real world. The company attended the Mobile Acceleration Week event in San Francisco last year and has since been working tirelessly on developing a stellar application for the Windows 7 platform. The application assists users with finding friends in the real world. In just two clicks you can find your friends current location, while sharing yours. People are using echoecho to help find a friend whether they’re in the same restaurant, out on a ski slope or even in a different country. You are in control of what you share, when you share it, and with whom you share it. People are using echoecho to help find a friend whether they’re in the same restaurant, out shopping or even in a different country. The service works anywhere in the world across multiple platforms, now including Windows Phone 7! The app, released last month, has already garnered good reviews on Marketplace. For more information about Echoecho, check out the Bizspark blog post on the new app. Make sure to stay tuned for more updates about previous and upcoming MAW events. Or, check out Twitter for the most updated information.